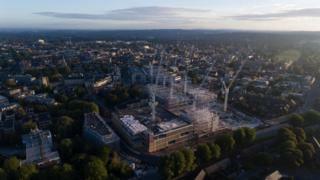 A new £440m shopping centre in Oxford has opened after a final push saw it finished just in time. Hundreds of shoppers have descended on Westgate Oxford, which replaces a 1970s centre that was demolished in 2016, after previous redevelopments stalled. An estimated 15m people will visit annually and 3,500 full-time jobs created, Westgate Oxford Alliance said. It covers 800,000 sq ft (74,300 sq m) and has space for 100 shops, restaurants and a cinema. BBC News's Phil Mercer-Kelly said there had been a "tense" rush to finish the centre in time "which gave way to expectation as the shops opened". There are now many queues to access several stores. Oxford City Council said it was confident the development would not harm other shops in the rest of the city. A spokesman added the impact of new centres in other cities had been looked at and the council expected footfall to increase across neighbouring streets. About a half of the units at the shopping centre were ready to start trading today, and the alliance's development manager, Sara Fuge, said the remaining ones would open in the run-up to Christmas. She added there was "pent up" demand for retail space in the city. The plans for the centre were approved by Oxford City Council in November 2014 and building work started the following spring. An archaeological dig took place prior to construction and allowed experts to explore remains of a medieval friary which once stood on the site. The redevelopment followed a previous plan to rebuild the site, which was placed on hold in 2008 by former owners Liberty International because of the financial crisis. An earlier £220m rebuild also failed to progress in 2002 when the government ruled it was not in keeping with Oxford's historic character.